GREAT FALLS — With 37 Class-C teams competing at state, the Charlo Vikings finished on top, earning a team fourth consecutive State title Saturday after two days of competition in Great Falls. The local boys earned a top team score of 53.5, edging out Belt by 1.5 points. 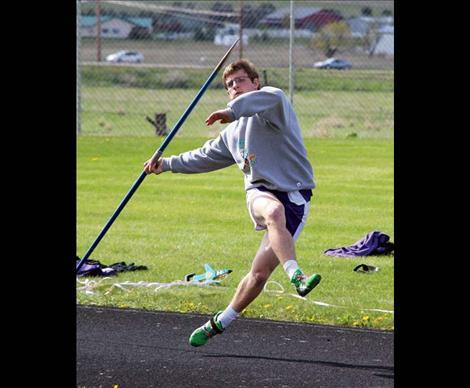 Though the Vikings were unable to secure an individual first place, Jacen Peterson’s silver in pole vault, clearing 13-0, and third place in javelin, hurling 162-01, plus Tyler Delaney’s multiple top five finishes were enough to put the Vikings on top. Viking Head Coach Bret Thompson said he was “pretty excited” and says the kids are “real excited” about the win. Tyler Delaney finished third in the 100 meter with a time of 11.38 and fourth in the 200 meter (22.81) and the 400 meter (50.73). Viking relay teams consisting of combinations of Peterson, T. Delaney, Michael Delaney, Kail Pope, and Connor Daugherty placed second in both the 400-meter and 1,600 meter relays. Michael Delaney also placed fourth in the 300-meter hurdles and took fifth in the 100 meter. Other fifth place finishers include Pope (300 hurdles) and Dalton Delaney (3,200 meter). “It was a different kind of win from the last three,” Thompson said about taking the State title without any individual first places. He said the mile relay run was instrumental in securing the trophy. Two Eagle River’s Kamiah Payne placed third in the long jump landing 20-0. The Eagles finished with a team score of 6, finishing 16th. The Lady Vikings finished in seventh overall with a team score of 22. Lady Viking Jordan Ludeman faired best out of the girls, taking second in the pole vault lofting 9-0. Aspen Runkel finished fourth in the 100-meter hurdles with a time of 16:36. Lady Viking relay teams consisting of Runkel, Madison Foust, Sienna Brown, and Shayna Nagy, grabbed third in the 1,600 meter and fourth in the 400 meter. Arlee’s Scarlets placed 17th overall with a team score of 7. Senior Jessica Knoll placed the highest for the Scarlets taking third in the 800 meter with a time of 2:25.04. The Scarlets relay team (Knoll, Becca Whitesell, Whitney Malatare, Alex Adams), placed sixth in the 400-meter relay. Thompson was impressed with his seniors, boasting “a couple of them,” have medaled all four years. “They have been great leaders,” he said. “Not only in the track program but also in school,” adding “it’s going to leave a void,” when talking about their departure. Thompson also acknowledged the time and hard work his assistant coaches Mike Krahn, Jared Miller, and Jim Peterson, put into the team. Team scores: Charlo 53.5, Belt 52, Jordan 44, Manhattan Christian 41.5, Broadus 37, Ennis 35, Bainville 22, Hot Sprints 21.5, Twin Bridges 19, White Sulphur Springs 16, Wibaux 12, Culbertson 12, Darby 11, Fort Benton 10, Chinook 10, Power 10, Savage 10, Harrison 10, Froid-Medicine Lake 10, Victor 10, Shields Valley 8, Alberton 8, Box Elder 8, Circle 8, Two Eagle River 6, Broadview-Lavina 6, Melstone 5, Terry 4, Dutton-Brady 4, Centerville 4, Fairview 4, Nashua 4, Cascade 4, Harlowton 2, Noxon 2, Winnett-Grass Range 2, Superior 1. Team scores: Seeley-Swan 62, West Yellowstone 52, North Star 47, Darby 35, Hinsdale 28, Belt 28, Charlo 22, Drummond 19, Broadview-Lavina 19, Park City 18, Chinook 18, Alberton 18, Harrison 17, Melstone 14, Saint Regis 13, Shields Valley 12, Winnett-Grass Range 12, Richey-Lambert 12, Hobson 11.5, Twin Bridges 11, Simms 10, Arlee 7, Highwood 6, Manhaggan Christian 6, Terry 5, Lincoln 4, Fairview 4, Cascade 4, Harlowton 3, Broadus 2.5, Valier 2, Willow Creek 2, Fort Benton 2, Big Sandy 1.